For two decades, Dr. Shlomo Raz made it a top priority to help educate and better train urologists in Latin American and Mexico, a small undertaking with a few urologists that has since grown to include thousands of physicians. Now, the Confederation Americano de Urologia (CAU), an organization of 8,000 urologists from Central and South American, Mexico and Spain, is honoring Raz for his efforts by naming its highest accolade in his honor and bestowing the first medal on him. 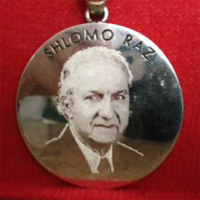 The Shlomo Raz Medal, a bonze medallion bearing his likeness, will be awarded to Raz on Oct. 2 at a CAU meeting in Lima, Peru. Born in Uruguay, Raz said his efforts began as a way to give back to Latin America, where he was born and raised. Dr. Mark Litwin, chair of the urology department, said Raz is considered an international dean of the academic and clinical discipline of female pelvic medicine and reconstructive surgery. The effort started 20 years ago, when Raz created and hosted a small CAU clinical symposium for Spanish-speaking urologists attending the American Urologist Association (AUA) annual meeting. Today, Raz’s conference showcases keynote lecturers from across the landscape of academic urology in state-of-the-art updates on topics of interest to practicing urologists. What started as an unfunded, grass roots effort by Raz has blossomed into a gathering so large that it now draws more than 2,000 attendees. The AUA now helps fund and promote the annual gathering, Raz said. The goal is for the urologists to learn about new technologies and the more advanced urological surgeries, Raz said, adding that other urology associations have copied his model and organizations now exist for Chinese, Portuguese, Arab and French urologists. The Shlomo Raz Medal will be awarded annually to a deserving urologist who works to further the mission of the organization. For more than 50 years, the urology specialists at UCLA have continued to break new ground and set the standards of care for patients suffering from urological conditions. In collaboration with research scientists, UCLA’s internationally renowned physicians are pioneering new, less invasive methods of delivering care that are more effective and less costly. UCLA’s is one of only a handful of urology programs in the country that offer kidney and pancreas transplantation. In July of 2013, UCLA Urology was once again ranked fourth in the nation by U.S. News & World Report, a ranking it has held for the last 15 years. For more information, visit http://urology.ucla.edu/.